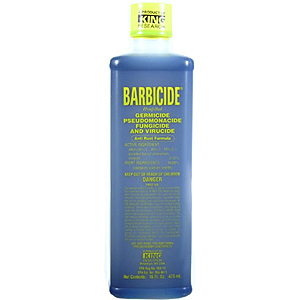 Barbicide Hospital Strength Germicide Fungicide and Virucide kills HIV-1 (Aids Virus) for disinfection of combs, brushes, shears, metal and non metal salon tools. Active Ingredients: Alkyl (50% C, 40% C, 10% C), Dimethyl Benzyl Ammonium Cloride (5.12%). Inert Ingredients: (94.8%) contains Sodium Nitrate.